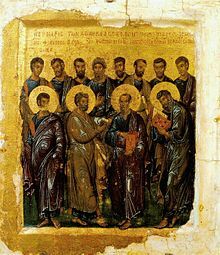 The Didache , also known as The Teaching of the Twelve Apostles, is a brief anonymous early Christian treatise, dated by most modern scholars to the first century. The first line of this treatise is "The teaching of the Lord to the Gentiles by the twelve apostles". The text, parts of which constitute the oldest extant written catechism, has three main sections dealing with Christian ethics, rituals such as baptism and Eucharist, and Church organization. The opening chapters describe the virtuous Way of Life and the wicked Way of Death. The Lord's Prayer is included in full. Baptism is by immersion, or by affusion if immersion is not practical. Fasting is ordered for Wednesdays and Fridays. Two primitive Eucharistic prayers are given. Church organization was at an early stage of development. Itinerant apostles and prophets are important, serving as "chief priests" and possibly celebrating the Eucharist. Meanwhile, local bishops and deacons also have authority and seem to be taking the place of the itinerant ministry. The Didache is considered the first example of the genre of Church Orders. The Didache reveals how Jewish Christians saw themselves and how they adapted their practice for Gentile Christians. The Didache is similar in several ways to the Gospel of Matthew, perhaps because both texts originated in similar communities. The opening chapters, which also appear in other early Christian texts, are likely derived from an earlier Jewish source. The Didache ((/ˈdɪdəkeɪ/ or /ˈdɪdəkiː/; Greek: Διδαχή, Didakhé, "Teaching"), also known as The Teaching of the Twelve Apostles, is a brief anonymous early Christian treatise, dated by most modern scholars to the first century. The first line of this treatise is "The teaching of the Lord to the Gentiles (or Nations) by the twelve apostles". The text, parts of which constitute the oldest extant written catechism, has three main sections dealing with Christian ethics, rituals such as baptism and Eucharist, and Church organization. The opening chapters describe the virtuous Way of Life and the wicked Way of Death. The Lord's Prayer is included in full. Baptism is by immersion, or by affusion if immersion is not practical. Fasting is ordered for Wednesdays and Fridays. Two primitive Eucharistic prayers are given. Church organization was at an early stage of development. Itinerant apostles and prophets are important, serving as "chief priests" and possibly celebrating the Eucharist. Meanwhile, local bishops and deacons also have authority and seem to be taking the place of the itinerant ministry. The Didache is considered the first example of the genre of Church Orders. The Didache reveals how Jewish Christians saw themselves and how they adapted their practice for Gentile Christians. The Didache is similar in several ways to the Gospel of Matthew, perhaps because both texts originated in similar communities. The opening chapters, which also appear in other early Christian texts, are likely derived from an earlier Jewish source. The Didache is considered part of the group of second-generation Christian writings known as the Apostolic Fathers. The work was considered by some Church Fathers to be a part of the New Testament, while being rejected by others as spurious or non-canonical, In the end, it was not accepted into the New Testament canon. However, the Ethiopian Orthodox Church "broader canon" includes the Didascalia, a work which draws on the Didache. Lost for centuries, a Greek manuscript of the Didache was rediscovered in 1873 by Philotheos Bryennios, Metropolitan of Nicomedia in the Codex Hierosolymitanus. A Latin version of the first five chapters was discovered in 1900 by J. Schlecht.